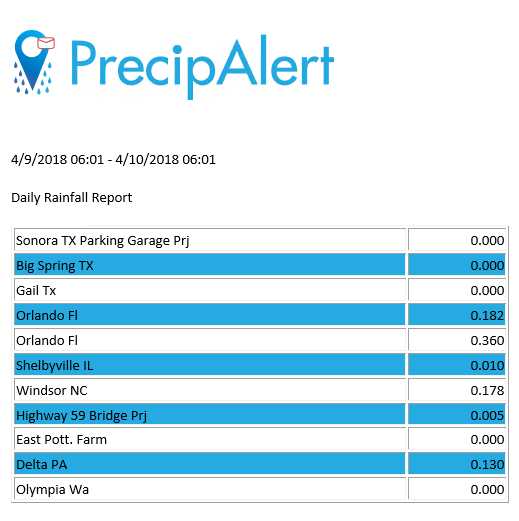 PrecipAlert provides daily emails that recap the last days total rainfall. The PrecipAlert daily email report delivers the last 24 hours of accumulated rainfall for each of your locations. Daily emails are sent twice a day providing you with an over night (sent at 6 am central) and daily recap (sent at 6 pm central) of each locations rainfall. The rainfall data is archived automatically for each location allowing you to create project or location summary reports of all rainfall detected throughout the duration of a project. View a sample monthly spreadsheet report by clicking here.